very pretty love the lace you use!!!!!! I can see Kathy loves her PL and I can sure see why, its stunning!!! There are so many beautiful elements to take in I could hang out and admire it for some time I'm sure. I'm love all things spring, so this really pulls at my heart strings. Well done sweet friend! Elizabeth you are correct this is by far the most outstanding pocket letter ever! It is scrumptious. I keep picking it up and touching it. It is on a hanger on my wall at eye level and I just spend time staring at it. How can someone get so much beauty into one spot? Crazy good. The photo is good but the reality ......... My daughters keep coming in and gazing at it, The bees Carri were perfect for Donna here and those birds Donna! I love them and so timely with my new rainbow lorikeet joining our family. I swear we have nothing this great in our craft supplies here in Australia and trust me I look! I am spoilt to have received this fabulous treasure from such a beautiful souled lady! Donna you are the inspiration behind my desire to better my own skills and every time you upload a piece it is wow I have so much to learn! Love love love and cannot tell which is my favourite as they are all spectacular! Oh. My. Goodness. This is gorgeous! I love the butterflies, birds, bees, dragonfly, honeycomb on the first pocket, the laces, flowers, the texture, on my! And, the edging, wow!!! I tell you what...you've made some fabulous pocket letters but this one, for me, takes the cake!!! It is absolutely exquisite!! I guess it's because the side bar is so creatively decorated, but every pocket is just beautiful!! Oh how I love all of your flying critters - a sure (and beautiful) promise that Spring is on the way!!!! This takes my breath away, Donna, it's so stunningly beautiful. I love butterflies and all of these are gorgeous and, oh my, all that glorious lace. If Kathy doesn't absolutely love this, she can send it right back to me! Oh my gosh, this just screams spring beauty !!! This is a beauty! Down the side is beautiful! My favorite pocket is three. Another Beauty! She will LOVE this! Good Heavens. It's amazing. So many beautiful eye candy pieces. You rock these PL. Stunningly Beautiful Bonnie!! Love all the fauna.. This is stunning Donna. Where did you get those gorgeous bumblebees? Bumblebees are my all time favorite insect. This is absolutely gorgeous. I have always remembered how good you are at these. beautiful work as always my friend!!! 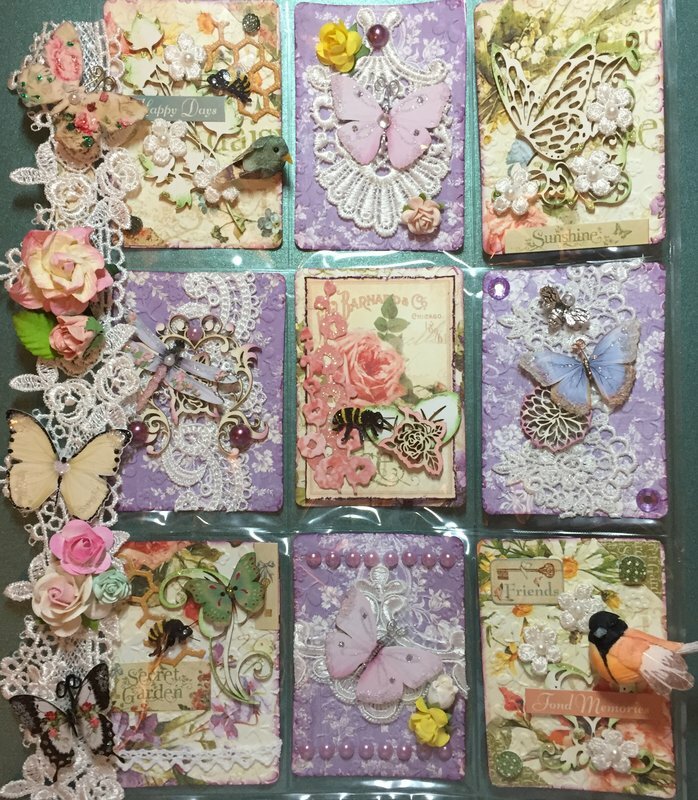 Pocketletter, Spring, shabby, butterflies, trim, chipboard.